Once you have chosen you wedding date and location, it is time to start inviting families and friends to join you two on this special day. This may include save the date cards, announcements and invitations. There are many wedding announcements & invitations styles from which to choose – from formal to casual, from silly to serious. 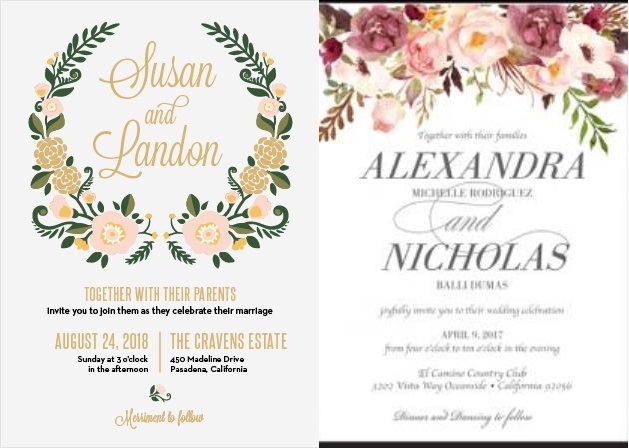 We listed a few wedding invitations to give you some ideas, but make sure your wedding announcements & invitations fit your style and personality, because it is supposed to be a special day for just you and your loved one. 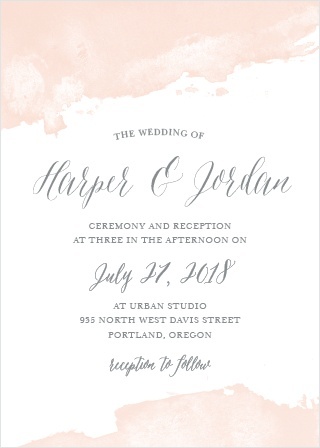 Different from the floral invitations, the olive leaves and the flowing script on top of the white background makes the invitation clean, simple, yet still elegant. Thanks to a color palette of green, pink, orange, and gray, flowing script, the botanical elements, floral invitations set the tone for a romantic wedding and add an element of elegance to your day. Color splashes at the top and bottom of the dip dye wedding invitations give the invitations a soft, ethereal appeal. What’s fun about dip dye is that you can come up with many different fresh and colorful looking invitation designs. Playing with all the colors and shapes you like also adds a uniqueness to your wedding invitations. The metallic accents for weddings is very popular among other styles. Brides have been loving the gilded details in all aspects of their wedding, from metallic wedding decorations, venues, wedding cakes, to chic gold wedding invitations. The luxurious foil stamping adds a touch of elegance and wealth to which ever style of wedding invitation you like. 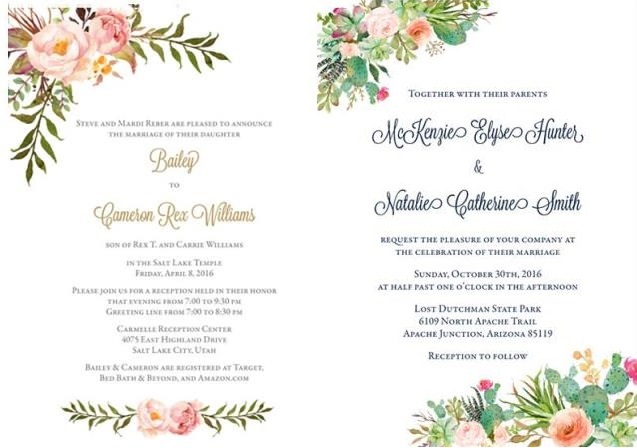 What is your favorite style of wedding invitation?